Over 40 researchers, professors, engineers, and students attended the kickoff of the Aberdeen Chapter of the American Helicopter society held at the U.S. Army Research Laboratory in APG, MD. 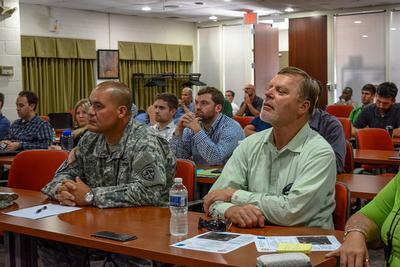 Affiliates from Boeing, Continuum Dynamics Inc., SURVICE, University of Maryland, ATEC, ECBC, and ARL were on hand. With a successful kickoff, the chapter will move forward with electing officers and planning the next seminars, tours, and outreach events. A video with highlights of the meeting posted by ARL can be seen below. The presentation material from AHS International, ARL, and the Nikolsky Lectureship will be posted soon. Interested in volunteering for a chapter position? We are looking to elect officers soon. Please send the chapter an email to volunteer. Have an idea for a seminar or outreach event? Do you want to showcase your institution’s research and facilities? Consider volunteering to host the next chapter meeting and get in touch with us. 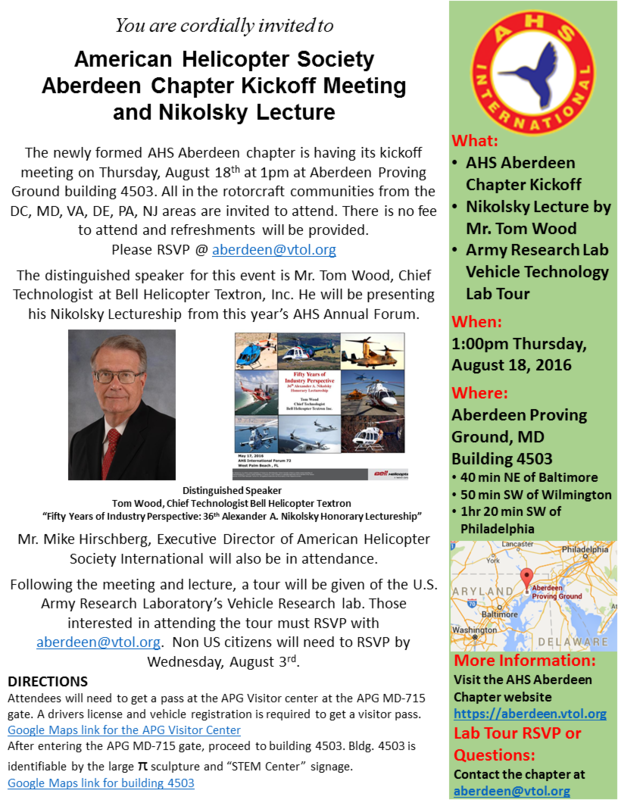 Due to installation wide exercises at Aberdeen Proving Ground on Thrusday the 18th, the AHS Aberdeen Chapter Kickoff Meeting and Nikolsky Lecture will now begin at 2:00pm.